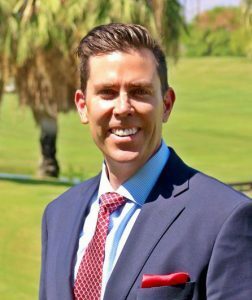 Mr. James brings more than 20 years of private management and public sector collaboration experience in land investment and development for residential and commercial projects ranging in values between $200,000 and $50 million. Most recently, he served as the Vice President for Land Advisors Organization for the entire Coachella Valley, Imperial Valley, and Morongo Basin. Other prior experience includes working for major housing developers, such as Toll Brothers, Inc. for the Coachella Valley and Inland Empire as well as Richmond American Homes of Nevada in Las Vegas. Beyond his professional experience, Mr. James also brings a long list of civic involvement including being a current member of the City of Indio’s General Plan Advisory Committee and previous involvement as a commissioner for the City of Indio’s Planning Commission and Land Use Committee, member of the City of Palm Desert’s Envision Palm Desert 2033 General Plan Update. He has also served as a Sworn Reserve Deputy, EMT, and Search and Rescue Team Member for the Los Angeles County Sheriff Department, as a Water Rescue & Search and Rescue Team Member for the Spokane County Sheriff, and as a Volunteer Fire Prevention Ranger with the United States Forest Service. Mr. James has a solid record of professional and academic achievement earning an M.R.E.D. (Master of Real Estate Development) from the University of Southern California and a B.B.A. (Bachelor of Business Administration) from Gonzaga University. Mr. James is currently pursuing a Doctorate in Policy, Planning, and Development from the University of Southern California.